On the face of it Lewis Jones' career stats do not reflect a great talent - ten caps for Wales, three Lions appearances - but that hides the fact that for a brief period before he switched to rugby league he was the wonder boy of Welsh rugby. His debut at Twickenham in 1950 (at 18 he was the youngest ever Welsh debutant) ended with him being carried shoulder-high from the pitch. To his bemusement he had been selected at fullback even though he had never played there. Later that year he became the first ever Lion to arrive on tour by aeroplane when flown out as a replacement. His performances there won him a string of plaudits. His versatility was shown by the fact his ten Wales caps came in three positions - fullback, centre and wing - and his pace from a standing start was awesome. 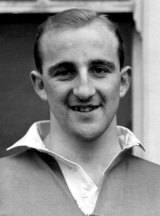 In November 1952 he switched codes for a then-record fee of £6000, revealing Leeds had been pursuing him for two years. The money plus the promise of a job (he was a bulldozer driver) proved too tempting. At 21 his rugby union career was over. In Rugby League he unsurprisingly shone as well, winning 15 Great Britain caps and one for Wales (it was their last game for 15 years). He became the first player to notch 1000 goals for Leeds, spent six years as a player-coach in Australia and after retirement became a schoolmaster in Leeds.